Ecosystem Translocation: The latest Climate Engineering Brainstorm | Watts Up With That? Ready to translocate the environment? Stéphane Boyer, senior lecturer at UNITEC Institute of Technology is worried that plants and animals can’t move fast enough to survive climate change. His solution: give nature a helping hand, by digging up entire ecosystems, and moving them hundreds of miles, to maintain optimum climatic conditions. Climate change poses a major threat to the world’s ecosystems. As the world warms, animals and plants will move to keep pace with their preferred climate, but many will be unable to keep up with the speed of change, particularly if humans are in the way. The history of my native Australia is a cautionary tale, on the negative consequences of introducing new species, but also a tale of the adaptability of species. Rabbits, introduced from temperate England, rapidly colonised the arid Australian desert. They are still a major pest species. For decades, Australia has funded a biological warfare laboratory dedicated to trying to kill the rabbits – so far without lasting success. The Prickly Pear at its peak took over 15,000 square miles of farmland out of production, because it was so difficult to control. The South American Cactoblastis Cactorum moth was released to control the problem, and largely worked out as expected – though in this case Australia probably got lucky. In other places, Cactoblastis is considered a damaging invasive species. The poisonous Cane Toad, introduced to control Cane Beetles, rapidly spread throughout tropical regions of Australia, wreaking toxic havoc on native predators, until the more persistent species of local wildlife finally discovered a way to eat them without being poisoned. My point is, if ecosystems are geographically connected, species will naturally find a way to adapt and / or move in response to climate change, no matter how fast it occurs. There have been many natural abrupt shifts in climate, such as the Younger Dryas, which were a lot faster than anything we are likely to cause. The ecosystem survived just fine. If ecosystems are geographically isolated from each other, given the havoc individual introduced species can cause, transplanting an entire cross section of one ecosystem into another in my opinion is just environmental vandalism. The combined system will eventually sort itself out, as new patterns emerge. But why do it in the first place? April 10, 2016 in Geoengineering. You can’t be an environmentalist and also a scientist anymore. That is the effect of AGW. This is just more demonstration if the fact. Can we leave this to evolution? No, apparently. Clearly the ecosystems need to be designed intelligently. must be the case and suggest acting on it. Surely any species that can’t adapt rapidly to changing climates would have been wiped out several million years ago when periodic glaciations started impacting the temperate and polar zones. Indeed, the lush (in Summer anyway) forests the Indians and later Europeans found in the NorthEastern US and Eastern Canada apparently moved into the area in not all that many thousand years while and after the continental glaciers melted. Might be worth keeping an eye on some high altitude faunal and floral zones in the East as there isn’t a lot of up for the plants and critters to move up to. But in general I think that the species that are there now will probably handle climate change a lot better than they handle folks draining their water and pouring concrete and/or asphalt over their habitat. “Adapt or die” works for plants, animals, and people. In fact, it has been estimated that 99.9% of all species that have ever lived on Earth are now extinct. The success of Homo sapiens can be attributed to the fact that billions of years of evolution have finally produced a species that can ‘adapt’ within a single generation through changing its environment by design. Now I realize most of the promotion of evolution theory was never about science, only about anti-religion. All the promotion about “science based medicine” isn’t about science either, as there are huge holes in the “science”. Tourist, your lack of smallpox and polio would like a word with you. There are issues in medicine, such as shameless promotion of treatments with minimal effectiveness, and shameful prolonging of suffering by overtreatment in end of life care. However, the vast majority of medicine is quite good. Just because some people are idiots does not mean that everything in science is wrong. However, I will say that the arguments about nature being unable to adapt are shockingly reminiscent of the arguments that I have heard saying that Earth could not exist without a creator. It is clear with various examples, including the ones in this article, they are equally fallacious. And the children whose life was destroyed by the useless flu vaccine would like a word with you. And the victims of the not so efficient hep B vaccine, probably the most terrible vaccine catastrophe. And the victims of the HPV vaccine. And all these women who got useless breast cancer screening, biopsy, and cancer treatment. MD are idiots. Most of them will promote the most absurd vaccine safety claims. I mean, hep B prevention on babies is useful? It’s an STD!!!!!!!!!! Also, how come the CDC and WHO aren’t widely seen as crackpots? These people are crazy. Even a 10 years old could see all this. It’s really simple. Just watch the graphs. Do some math (school level math). Can MD even do that? What lives destroyed by flu vaccines? As for Hepatitis B or HPV, when else are you going to give these vaccines but as early as possible? HepB is a bloodborne pathogen. You can get it by improperly cleaning a friend’s badly scraped knee. The vaccines have lifetime effectiveness, so there is no point in delaying. As far as the harm they have caused, those links are speculative at best, and have very limited evidence. However, one ironic thing is that all of those links (whether proven or not) are certainly drawn from “science based medicine” themselves, which you are so vehemently criticizing. And on the breast cancer, yes, that is an example. However, it’s not “science based medicine” that is a failure of overdiagnosis and overreliance on an imperfect technique. Medicine, like all science, works to improve over time. If these arguments had merit, then they would be adopted. For example, recommendations for mammograms have been reduced to counteract the problems with overdiagnosis. That’s how science works. It’s not science that you have an issue with, but people getting things wrong or using the research improperly. Those are entirely different things. Those with a (probably autoimmune) narcolepsy. For what potential gain? None! This vaccine has never been shown to protect against influenza!!! Never. There is no proof that they are useful. The proxy is not the real thing. We don’t even know for sure whether HPV causes cancer. Also, the worst cases of Hep B seem to be autoimmune hepatitis (like many deadly influenza cases) and I know I won’t vaccinate against any such disease. As they said every single time!!! The point is avoided a global health catastrophe with massive amount of MS and other horrible diseases. All the vaxxers can do is mud throwing, they are a pathetic group, even SkS-pathetic. I’ve always found that logical disconnect amusing. They say, “There’s no such thing as ‘Intelligent Design'”. All is only natural, including humans. Yet Man’s influence (real or imagined) is deemed to be “unnatural”. So now Man’s intelligence (Man being natural and all) that messed “Nature” up is going to use his “intelligence” to return “Nature’ to what they believe it should be before his “natural” impact that was only natural to begin with? I am reminded of the fabled simpleton who would go into his garden and spend time every day pulling on the plants to ‘help’ them grow only to have them wither and die. Have you seen this? I’m apoplectic. The Rockefellers are funding these massive bureaucracies, like a govt w/in a govt. They’re going to do it w/in each state. Colorado is the first one. They are clamping down on any energy production in the state in the guise of “emissions” reduction. And they have to increase renewables. And of course the water, too, cuz who knows how much water w/b affected by “climate change. They are just ASSUMING that it’s all valid: Did you know we are going to have 2 degrees of warming by the middle of the century? http://rockymountainclimate.org/programs_3.htm I am going out of my mind. They are purposely taking down the economy of the EU & the US. They’re creating chaos everywhere so we can’t possibly resist their global govt. Just when we need to make preparations for cooling they are destroying energy production. Yes, and they openly admit it. Anyone who believes ‘Climate Change’ is about temperature is naive. It’s nothing more than a red herring. Tyranny thrives more readily in low-tech environments. The final objective is a world-spanning dictatorship – the Fourth Reich, as it were. Once the rabble are thoroughly subjugated, the Ruling Class can sort out among themselves who will be the Emperor of the World, his Court, and his Minions. Most species of plants have habitats that expand for hundreds if not thousands of miles. I find it hard to believe that a change in the earth’s temperature of even 2 or 3 degrees is going to kill all of them. … So, in other words, these ” scientists ” have no faith in Mother Nature ! Stop the bus, I want to get off. I’m too old for this and the world is truly going nuts! Agree, and who pays for this nonsense? ..The problem is that the ” silent Majority ” stays silent ! I hope it involves Dodge trucks. 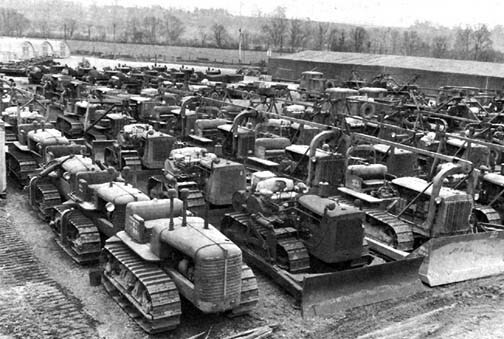 The photo of the tractors reminds me of the old Soviet Union, where they that set 5-year tractor production allocations in tonnage, rather than in units..
What this brilliant government controled policy actually created were fewer tractors that were so heavy, they’d sink in muddy fields…. Isn’t centralized government planning great? What could possibly go wrong with the government running things?….. The Government has put the lunatics in charge of the asylum, and is rewarding them handsomely. The govt didn’t initiate this. Of course the administration is going along w it. Presidents are just puppets. Governments are asylum chambers, windowless without outside fresh air, being ruled by self created utopia gods. Engineered by lunatics. Political Party gods. One word – FUBAR an Interstate Hwy shovel with a handle 30m long so all collectives may participate equally. The “environment” with its animals and plants has survived far more rigorous change than 0.7dC is inflicting on it. The current CO2 concentration of 400ppm is working well with the plants. They don’t seem to be worried about it at all. Staphane: if it ain’t broke don’t fix it. And you had be darned sure it really is broke before interfering with it. Remember the polar bears! They were an `endangered’ species and overnight (literally) they weren’t. Don’t move them to the coast, NZ may just tip over and sink, like Guam ! You guys and gals lack a sense of humor. I’m pretty sure this is a joke. Sort of like a Chinese April 10 fools joke. It is April Fools in climate science land every day. Take for example this latest ‘peer reviewed’ study, Melting ice sheets changing the way the Earth wobbles on its axis, says Nasa. I kid you not. 1) Make ridiculous statement about eco-thing. 2) If said ridiculous statement is widely ridiculed, accuse ridiculers of hating the planet. 3) If said ridiculous statement about eco-thing is not widely ridiculed, agitate for government money to study/fix ridiculous eco-thing. Yeah, I’m thinking the fools in climate science aren’t limited to just one month of the year. After April, they can still likely go Nuts in May. This is obvious loopy stuff. Most of Greenness is not so obvious loopy stuff. The behavior of crazy people escalates as they further loose their grip on reality. Not so obvious loopy stuff is replaced by totally obvious loopy stuff. That doesn’t mean that the crazy person has developed a sense of humor. It’s a joke? I’m not so sure. Remember the scientist who wanted to form an emergency group to refreeze the Arctic? I despair more and more at the stupidity of academics and their ability to think. A Greenie dumber than a tree. Shows Greenies dumber than rocks abound. LOL. That should win quote of the week! I love it! Hey Eric, see you in Gympie ! Climate change threatens entire ecosystems. Anyone here thinking Boyer is better on than nature? A ‘ Boyer ‘ in german is a ‘Bauer’, a peasant that plants and seeds – a Farmer. In Celthic he belongs to the ‘Boii’, the ones who evolved europe from midterran to high civilication. What’s up whith him? In English this sort of minor revelation will henceforth be known as a “wundersamer”. Also, you will be moved North if required as you may be endangered. You think You’ve got something to say? And You’re the North moverer? Presumably this is likely to be considered primarily for species which are limited in range, low in numbers and unable to adapt well? In New Zealand there were rabbits, opossums and gorse introduce and all went crazy within that environment so I agree that what they suggest is insane and could ultimately do more damage than good. And this guy, Stephane Boyer, is a senior lecturer at this establishment? This, therefore, indicates that he is teaching (or I should say misinforming) the next generation. He thinks or is convinced, from the sound of his stupidity, that an increase of approx. 0.7 deg. C in over 100 years is going to threaten the ‘ecosystem’? I give up! There obviously is no end to this insanity. He should be led away by men in white coats, put on meds and isolated from the rest of humanity, so he cannot inflict any more harm. This, therefore, indicates that he is teaching (or I should say misinforming) the next generation. Luc, leading S Boyer away by men in white coats and isolated him from the rest of humanity would be akin to ridding Australia of one (1) of their rabbits. DUH, currently, …. all public schools and universities are primarily staffed with teachers, instructors and professors who are likewise miseducating the next generation …… the same as they miseducated the past 3 or 4 generations. And there is no possible way to “re-nurture” all of the millions of previously miseducated students. Maybe some old inmates are still there ? It is a pity that stupid of this magnitude does not cause serious physical pain. Ideas this bad should cause immediate implosion of the brain. “Ecosystem Translocation” or the latest Climate Engineering Brainstorm must be the front-runner in the 2016 annual award of the Grand International Monster Raving Looney Crazed Idea Competition. The leftist psychology always concludes that grand top-down redistributive meddling is necessary in order to prevent diverse outcomes i.e. the existence of winners and losers in the game of life. Of course, in the field of social engineering this generally leads to mass poverty, enforced uniformity and tyranny. Left to their own devices such people would inevitably conclude that even nature is in dire need of their wise assistance (i.e. idiotic schemes and constant meddling). Should these people be allowed to put their utopian ideas into practice then expect catastrophe. Agreed. The Left would love to redirect the economy to a Grand Cause. Digging holes and filling them back up is as good a task as any. Environmentalism is a tool to get people to accept the change. Hitler, Stalin, Mao, Pol Pot… to name a few. Big dreamers make for big bad rulers. The authors write they found “rapid community turnover, migrations, development of novel ecosystems and thresholds from one stable ecosystem state to another” but “very little evidence for broad-scale extinctions due to a warming world”. 4°C and beyond: what did this mean for biodiversity in the past? Just when I think the warmists have reached the limit in stupidity, they make a heroic effort and set a new standard. Einstein was right, human stupidity is infinte. Cover everywhere with solar panels, that’ll make them move. Well done Mr. Worrall. A lot of things are engineered and if you recall Enron, I saw them take down small companies (including my own and that of an associate). I watched with joy as they Imploded. A lot of the fellows involved in that fiasco stashed their loot and moved along where they continue the same practices to this day. Here is my latest article on Sun Edison and it just went up at the Daily Bail. We have a microscope on this situation and will add updates in comments with articles at the ready for any developments that may occur on Monday. They should ask for volunteers. Lots of people would help “set this company on fire”. Here is an article that my counterpart, Barb, wrote awhile back. We will be working on this developing story and have a lot of information to bring forth. (NECN) – On This Week in Business, Paul Gaynor, the CEO of First Wind talks about the upturn in the IPO market and his meeting in Washington this week with Treasury Secretary Geithner and Energy Secretary Chu about the role stimulus money has played in helping his business. the brilliant solution would be to teach the plants to walk! Walking plants? This is how we got triffids. Not a good idea. OK, that is probably worthy of an April 1st joke. More seriously, plants already do exploit many methods for a living organism to rapidly move long distances. Aside from the direct use of wind and waves they have other vectors to use, such as birds. And now they also have humans that can quickly, and often accidentally, distribute living organisms or their seeds to the most distant places on the planet using our fossil-fueled engines. Back in the ‘golden years’ of environmentalism they used to argue that species were being too quickly relocated around the world by humans. Now some of them want to claim that they cannot adapt move fast enough. Many questions remain unanswered. We don’t know (…) even whether it will do more good than harm. or he is a closet skeptic attacking the enemy from the inside. Dig up entire ecosystems and transplant them? Just when you think the Eco-loons have run out of ways to spend other people’s money they excel themselves. In any given ecosystem, there could be thousands of species (many of which we still don’t know about). This is why children are controlled and managed – they do not understand the ramifications of many of the things they wish to play with. How do you move an ecosystem when there are thousands of possible species that you are not aware of, hence do not know of the interactions of these species within that environment? Rabbits, introduced from temperate England, rapidly colonised the arid Australian desert. That’s not surprising: the rabbit is a desert animal, introduced into England by the Romans. They struggle in snowy winters, and have only really become a pest since people stopped eating them (ie. post WWII – folk were glad of them during the war). Nah, they evolved to become the Snowshoe rabbits. Dead wrong. They are thought to have evolved on the Iberian Peninsula about 4k years ago. Also if raising them in warmer areas they have a rough time dealing with the heat, people will put ice bottles with them and the like during the summer. They do not struggle in snowy winters in any vague way, they in fact thrive in colder climates much more readily then the very hot ones. Yes, the Iberian Peninsular – Spain – is conserably warmer and drier than England. The fact that people providing cooling to bred rabbits is not relevant evidence. Rabbits do not hibernate, so they starve when it’s snowy. They have to resort to eating bark off trees. Sleepalot, is that not a snow-covered beaver lodge in the background of your posted picture? Now iffen that de-barking was rabbit chewing’s ….. then it musta been chewed on by big rabbits when the snow was 18” to 20” deeper. lol Ive raised rabbits for over a decade and am well read on them. They absolutely excel in cold places and are very hard to raise effectively in hot places. There is zero debate at all here, you simply do not know what you are talking about. Also spain is NOT desert as claimed. They are given ice because they sit there panting all day, barely ever breed and do not taste nearly as good in warm spots because their eating cycles are all messed up as well. BTW the not relevant evidence is the idea they do not hibernate and struggle finding food in winter. This is true of the vast bulk of animals that live in colder areas. Surely you knew that? People in very hot spots need to often breed through several generations to even get decent performing stock whereas this is no issue for those in very cold spots such as where I live. raised in captivity the winter food issue is also obviously meaningless, whereas you will have issues in very hot areas irregardless. Chickens and even ducks need protected from extreme winter cold. The rabbits this is no issue, they take it readily. @ Samuel No, pic taken in England (Cumbria) – no beavers here. The picture of tractors may have been a small part of the mass of machinery bought by the Labour Government for the Tangyanika Ground Nut scheme, it cost millions and produced small quantities of nuts and was quickly abandoned by Nuts who dreamt it up.They managed to turn hundreds of acres of land into a dust bowl. Science and Socialism working hand in hand! The area on which Unitec’s main campus is located was formerly home to the Whau Lunatic Asylum, later known as Carrington Hospital. Fox News …The UN starts toward new control over the world’s oceans !! It has always been about power !! Passive aggression. Invent an insanely expensive and very likely harmful geo-engineering “solution” for something which they know will never be implemented anyway, as a means of frightening people into accepting “more reasonable” climate mitigation strategies like giving up fossil fuels in favor of “green” energy. For decades, Australia has funded a biological warfare laboratory dedicated to trying to kill the rabbits – so far without lasting success. The embedded video plays a short advertisement first, and then the video. You might have an add-blocker plug-in that prevents the video from playing. Perhaps they can undo the damage of the last glaciation while they’re at it. Many years ago during a visit to http://www.newenglandwild.org/visit/Garden-in-the-Woods I noticed they were selling a wildflower I hadn’t heard of before, Oconee Bells. A note said they used to be native, but weren’t able to recolonize New England after the last glaciation. I bought some, and tried to plant them in a good area (ISTR they like Maidenhair Fern habitat), but they struggled for a few years and died. I might try again some year in a sunnier area. They also got munched on by some insect, it’s possible it wasn’t around before the glaciers. I’m glad that Unitec isn’t trying to restore glaciers to our long term average conditions. Cranberry Glades — also known simply as The Glades — are a cluster of five small, boreal-type bogs in southwestern Pocahontas County, West Virginia, USA. The natural history of the Glades has been traced back at least 12,200 years. Apparently, a forest of conifer-northern hardwoods replaced tundra with the end of the last Ice Age. The Glades are a 750-acre (3.0 km2) grouping of peat bogs resembling some Canadian bogs. The gladed land is highly acidic and supports plants commonly found at higher latitudes, including cranberries, sphagnum moss, skunk cabbage, and two carnivorous plants (purple pitcher plant, sundew). The Glades serve as the southernmost home of many of the plant species found there. The area is not entirely a glade, but a bog or wetland covered with all sorts of decaying vegetation. The peat and decaying organic matter is more than ten feet thick under the dense plant cover. The ground is not as much as quicksand or swampy, but spongy. It is in a high valley, about 3,300 to 3,400 feet (1,005 to 1,036 meters) above sea level, surrounded by the Cranberry, Kennison, and Black Mountains. Neat, I think I’d lie down in front of that bulldozer! The first bog I visited was in northeast Ohio, courtesy of my high school’s “Field Ecology” summer course. We got to drill tree cores, something handy to know about here at WUWT. This boggy area will be moved North to “protect it”. A boggy area in Northern Canada will be removed to provide a new location for it . Best you don’t visit that day. Oconee Bells are native to and survive in a very small ecosystem, the Jocasee Gorge, here in Oconee County South Carolina. Unfortunately for the flower, most of Jocasee Gorge is now Duke Power’s Lake Jocasse. What remain can still be seen every year mid-March to early April in Devil’s Fork State Park (well worth visiting year round for spectacular scenery). One of the great things about WUWT is that no matter how minor a tidbit I might comment on, someone else can chime in with much more information. I hadn’t realized it was so scarce today in what I guess has to be called its exile on a climatic island. I think, therefore I are smart. It seems genetic modifications of some plant scecies can take place in times as short as 15 years. So they can adapt to this mind-blowing climate change of 1.5ºC/century. Best Onion story ever !!! The Onion is almost out of business because it can’t compete with leftist lunatic stories like this. Reality has become one big Onion story. There was a time not too long ago when if somebody seriously proposed something like this, two guys in white would show up with big butterfly nets and would take them away for a nice long vacation in a padded room. Now a days, not only are these crackpots not laughed, they are taken serious by almost every major news agency. I really miss those saner times. NASA releases study that claims ” Climate Change ” has shifted the Polar Axis by a ” Shocking” amount !!! The study found that the Polar Axis has moved 17 cm/year for 15 years ( 8 ft ) BUT, their pretty pictures make it look like it’s moved 1,000’s of miles !!! Seriously pathetic desperation ! I agree wholeheartedly (even though my sister, my older sister, claims I don’t possess such an organ) with Boyer. But, I think, before we move ecosystems poleward, away from environments that’ll become to hot for them, we must first move our movers and shakers, our intellectuals, our elites, our betters, to cooler climates so they can be protected from the roasting heat waves a’comin’. That way they’ll be safe and available to protect us in the desperate future. For some unexplainable reason, perhaps to experience our upcoming global warming pain, our elites all seem to congregate in tropical hot spots: you know; places like Bali, Durban, and Cancun. Sure, I understand the selflessness, but surely these locations, already tropically warm, will quickly become unsurvivably hot in a warming world. Surely, as the most important members of our species they must be the ones moved first to cooler climes where the deamon breath of singeing heat may be tempered. How about Yellowknife, Northwest Territories, Canada; or Dawson, Yukon, Canada? Fairbanks, Alaska, USA? I’ll even work on a fund to pay for the relocation expenses. Perhaps, considering that Boyer works for UNITEC, the movement should be from Auckland to the Auckland Islands. I understand that many people pay a premium to live on one of the islands off Auckland (they are the same thing aren’t they?). If humans are causing the extinction of animals and that’s not natural, then either we are aliens from another planet and not part of the ecosystem, or these scientists are blantantly rejecting evolution. But he does kinda nail it; except for not acknowledging God. ..If we really want to help the ecosystems of the world, we need to protect them from the Eco-Fools that think like Boyer, which is pretty much all of them ! Fascinating. It’s evolution in action. Natural selection allows a species to adapt to its environment and – over time – evolve into a different species. “We don’t know …… whether it will do more good than harm.” More proof that anything, anything, that supports the AGW narrative is published. Make sure they pack the mosquitoes, rats, and any other verminous species. They’re important parts of an ecosystem, too! Spreading disease and parasites en masse is a small price to pay to save our wildlife from the unbearable 2 degree warmer habitats they’ll have a hundred years from now. Dislocte ecosystems? Why, certainly, because dangerous global warming just may cause them harm. 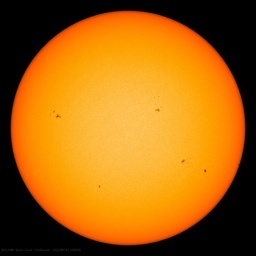 There is always that lurking “dangerous” warming in back of it that is an excuse for stupid, inane and very expensive actions these bozos suggest. They are brainwashed to believe it. It gets worse when they also cite the precautionary principle that fives them the license to act in the absence of any scientific data or observations. And don’t forget that there is always that lurking “dangerous” cooling, too. As if the “ecologists” understand ecology well enough to engineer it. Locally, in the Hill Country of Texas, we have a problem with Ashe Juniper, aka cedar. Probably the issue is fire suppression by Anglos, but the problem is real. Of course, a solution would be a bunch of fires, but that could be worse than the problem. Any chance of unintended consequences with this? See the logic here, to stave off danger of slow change they are going to force immediate change. Ugh. The wacko environmentalist is the scourge of the planet. Idiot, holier than thou nincompoops!! Plant life survives proper glaciations. Asteroid strikes, massive volcanic eruptions and all manner of catastrophic events. Why are lunatics intent on keeping the world exactly the way it is, it’s the stuff of delusional minds. almost all species to ever have existed are extinct, here we come and think we can keep the world just as we wish, same ice, temperature and biological species. Must be some sort of complex? ..Liberals believe THEY are GODS ! It’s the same problem that views global warming as something that is going on for ever. There is no appreciation of where we stand in the long history of the earth. NB the same blindness to anything but the immediate present and your own short memory, pervades the stock market, commodity market etc. Nobody can believe that your present environment (plus the immediate past) is not permanent. Dumb investors and most of their advisers think that the present market vacillations are just a blip on a stock market that will keep going up for ever. Skeptics tend to assume, rightly IMHO, that the stock market as it is now configured is not much more than a Ponzi scheme. Maybe they should move the ecosystem to the planet they come from. Better yet, they should go back there themselves, and leave our planet alone. It’s doing just fine. Would somebody please put these people in an asylum where they belong? The level of stupid is not funny anymore. 2. For most species, I expect that their habitat is not one square meter. More likely, they live over a range of conditions. So, they wouldn’t have to move from the current warmest extent to past the current coldest extent. If the range were to get warmer, then species would need to migrate from the current coolest to the future warmest extent of the range, which may wind up being zero move at all. For the few species which might have trouble (range limited by altitude), first identify them, and then we can talk. “Got a Dream Boy, Got A Song, Paint Your Wagon and Come Along!” Yaa Hoo! Classic Big Green from Team Gangrene. Eco-Nasties,you just can’t parody them. Why not do what any greenhouse grower would, Increase CO2 and temperature to increase plant production? This article reminded me of the story of a Wyoming coal mine, that relocated a tree being used by Bald-headed Eagle for nesting, at the cost of some USD 1 million (in the 80’s), as the tree was in the mine path. The job was completed with lots of good feeling all round, apart from the unfortunate incident a month or so later, when said bird sat on some power lines and was incinerated. How many bald eagles are wind turbines allowed to kill? I’ve seen you’ve searched the internet for my name. Be assured you’ll find all my relevants at the cementary. You dire strait have to go after me. Why move the eco-systems? Just planting a few representative species will work just as well. At first I was inclined to characterize this idea as ‘half-baked’. On reflection it appears to be more of a ‘raw-cookie-dough’ idea with rancid butter, moldy flour and spoiled eggs as the principle ingredients. Baking isn’t gonna help. What about the species that already exist where you wish to do your Tera-forming? My mother lives one street away from Unitec. It is not a University, and of course it doesn’t need to be. I should point out for the record that it is in a country which is NOT geographically connected so that migration of land creatures is NOT an option. Whether this particular idea is dumb, I don’t know, but relying on migration would be, if the threat should happen to be real. As things stand, the main threats to native creatures are loss of habitat and introduced predators (cats, dogs, and above all, possums). Which of course raises the question: if you move an ecosystem, where do you put it that doesn’t already have people and their animals or crops? Imagine the horror when an entire Northern Hemisphere ecosystem is dug up and moved north…only to realize the climate is cooling!